Being a new mom is full of excitement, joy, but also lots of questions. One of those questions would be do I need to create a baby registry? If so, what should be on my baby registry? As a mom of two, the answer is: yes you need to create a baby registry. Here’s why: it helps people know what you need/want for your new baby. Also, you can also get free stuff from retailers just for signing up (and who doesn’t like free stuff?). Now back to the main point of this article, the baby registry must haves. In an effort to fully disclose, this article contains affiliate links—basically means if you purchase something I receive a commission, but it doesn’t change the price in anyway. You can read more about it on my Disclosure/Advertising page. It can be a lot to remember when it comes to the baby registry must haves which is why I created a fancy printable checklist for you! I confirm that I would like to be subscribed to Mom With Cookies and receive emails (you can unsubscribe at any time using the link in the bottom of each email that is sent). The reason you register for big ticket items is because most baby registries offer a discount coupon on anything that is not purchased from your registry. That way you can finish getting everything you need even if you didn’t already receive it as a gift. If you are already planning on buying it, then waiting a little bit longer could save you hundreds of dollars on a crib/stroller/nursery furniture. 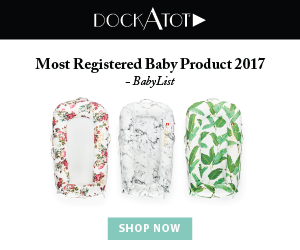 Audrey from Mommy Enlightened writes a great article about the top baby products that you will need that include some of those big ticket items. If you decide to have a baby shower, people buy you stuff (weird concept, right 😉 ). Well that being said, not everyone can afford the same amount which is why it is important to pick items that vary in prices. This goes along with the fact that not everyone shops in one store you created a registry in, so register in multiple stores (bonus: more freebies from each place). What are the essential baby registry must haves? I am a firm believer in fostering a love of learning and what better way than with books you can read to your baby. Whether you are breast-feeding, bottle-feeding, or pumping, you will want to have some bottles on-hand. If you are bottle-feeding or pumping, you will want quite a few! , and have 6 small bottles and 6 large bottles. Well, if you have bottles, you are going to want a few things to clean them in. What I couldn’t live without was a bottle brush. Also, I have a sterilizer because I wash my dishes in well water, and I don’t think it’s bad, but I am a little paranoid. There are a lot of other bottle accessories like a bottle basket that you can use in the dishwasher so you don’t have to wash them out by hand, but I prefer hand-washing. This is a MUST. Really no getting around it, but you will need a diaper bag or backpack. It’s what you will carry all those diapers, wipes, bottles, extra outfits, and other necessities for whenever you leave the house (and you will want to leave the house…cabin fever). Diaper bags don’t have to just be useful, they can be stylish too. Baby’s got to sleep somewhere! Some parents opt for a bassinet for the beginning few months, and others just use a crib from the get-go. That will all depend on how you feel. I personally just went with a crib from the start so I didn’t have to worry about transitioning baby from the bassinet to a crib. The crib essentials would include a crib mattress (they don’t normally come with the crib), crib sheets, and a baby mobile if you so choose, but not quite a necessity. One of the last crib essentials would be a waterproof mattress protector. Babies have accidents, diapers can only hold so much after all. This is why having a waterproof mattress protector is essential for prolonging the life of a mattress. This is one of those, register so you can buy it later with a coupon provided by the retailer you create your registry with. You won’t use a high chair right away, so if you wait, no big deal. Again, this is another one of those instances where you can register for it and then get it when you receive your coupon, or who knows someone awesome might just get it for you! Anyway, a lot of stores have a stroller/car seat combo and the car seat clicks into and out of the stroller with ease. There are going to be times when you need to do something and can’t hold baby (like showering, cooking, cleaning). So, having a bouncer or swing is pivotal to making sure your baby doesn’t get into anything while you have a quick moment to yourself. It can be tempting to register for those adorable plush baby blankets. Swaddle blankets are so nice for getting your baby to sleep. Flannel receiving blankets are great for many purposes. They can be used as a blanket, a large burp cloth, or even a blanket you can change your baby on so avoid getting messes on things. Also, they work wonders for helping baby keep his or her head upright when they are so tiny in their car seats. I’m pretty sure they don’t even let you leave the hospital with one of these (at least in the United States). I like car seats that are easily interchangeable among vehicles. How it works, you need 2 bases and just the one car seat. Then you can click it into both bases depending on which car you are going to be driving. (Not as easier when they are bigger because they are big and bulky). Also, it is so much easier to bring a baby into the store still in his or her car seat. For the purpose of this article though, the medicine cabinet essentials would be baby Tylenol, nasal saline, baby Orajel, thermometer, nose Frida, and baby cough medicine. In particular, the Zarbee’s baby cough medicine. This one is more self-explanatory, but a baby bath is definitely one of the baby registry must haves. There are simple baby baths, and there are baths with all the bells and whistles, it’s just a matter of deciding which one you need. Bath time essentials include washcloths, baby wash and shampoo, nail clippers, and a comb. Don’t worry, most places have a gift set that includes a comb, brush, nail clippers and such. Lastly, the final baby registry must haves are diapers and wipes. When it comes to diapers, I would register for one pack of newborn, one pack of size 1, and one pack of size 2. The thing is, no matter what a sonogram weight estimate is, you won’t know how big your baby will be until he or she is born. Also, hold on to receipts for diapers in the off chance that your baby doesn’t need any newborn sizes. Baby registry must haves also should include baby proofing products! While some of these you really won’t need until your baby is mobile, it is still a good idea to get these in preparation. Now there are so many different brands, but they all do the same thing, so just find the cheapest one. The next baby proofing products that should be in your baby registry must haves are cabinet locks. There is also a wide selection of these, but I really like the magnetic ones that are more hidden. Now there are some that you have to screw into a cabinet door and there are also some that use an adhesive to stick to the cabinet door. Just make sure you know which one is which. My husband and I initially bought these, but as they were the screw-into-cabinet kind, we got a double-sided adhesive tape. This way you can save your cabinets but still use them! Another baby proofing product you will NEED is a baby gate.This is especially for those of you who have stairs. Baby gates help keep babies out of certain areas and in particular from falling downstairs! Depending on how many stairways you have, I would suggest getting one for each set of stairs. The next baby proofing product will depend on if you have bifold closet doors. They are quite the common occurrence, but to avoid any pinched fingers, you will want to have a bifold door lock. This is the one I have and it is easy to use. All you do is slide it out of the way when you want to open the doors. You can register for clothes, but chances are people are going to buy what they think is cute for you, and in all honesty all baby clothes are cute! I would leave this off and let people do their own deciding. While there are quite a few baby registry must haves, it’s important to note that you have the final say in what you register for. Also, you might have friends or family who has gently used items that you can use and wouldn’t need to register for. Simply use my printable checklist so you know you haven’t forgotten anything. Please also share with all your other friends who are expecting so they don’t miss out! This is a great blog! It’s so simple too and not overwhelming. Babies just need the basics.